So often it seems, I’m feeling too busy to cook. Or I’ve been developing recipes all day and don’t want to cook any more. As dinner time nears, I scratch my head thinking: What’s going to fill that spot on our plates next to the chicken or chop or fish filet? Yes, simple veggies are a must, but how about something starchy? My answer is usually a quick one: Couscous! It’s versatile and so fast to make. 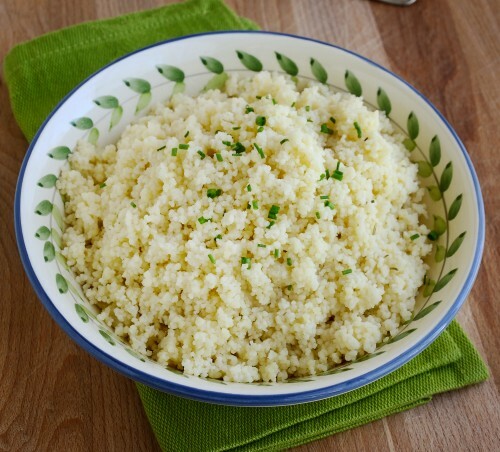 Couscous, common to North Africa, is tiny pearls of semolina pasta. Traditionally, it is most often served as a base for stews. Find it in grocery stores near the pasta or rice. If using fresh fragrant rosemary here, add just a little, minced. And if you prefer wine, use a sauvignon blanc or chablis, or a wine that’s not too dry nor on the sweet side. Be sure to add a bit extra salt. In a 3-quart saucepan, combine all ingredients except couscous. Bring to a boil, uncovered, and boil for 1 minute. Turn off heat and stir in couscous; cover and let stand for 5 minutes. Stir and serve. Now that’s fast! Makes 4 servings (3-1/3 cups) Recipe may be doubled. The cous-cous is a great counterbalance for the spicy seasoning and the “recipe” can be easily scaled or modified to suit. I can completely relate to the dinnertime dilemma. Compleeetly. I love couscous but have never added wine. What a great idea. We fly home from Maui tomorrow and this is going on the menu b/c I’m definitely in the mood for easy food!! Susan, if you do your own thing with couscous, let us know. Oh! And I love the photo. The green of the napkin really makes the photo jump off the page. I just wish it could jump onto my plate. Right now.